It's official. Mobile music services are overpriced by up to 85%, according to Strategy Analytics. In summary, the Sprint Mobile Music Store is better than Verizon's V Cast service, but both cost too much. Where will iRadio fit in the scenario? Motorola, Yahoo! Music, and PepsiCo launched an entertainment site called Cool Tones & Motorola Phones. 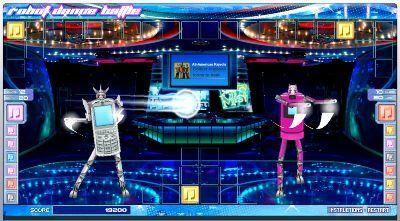 While Mariah Carey, the All American Rejects, and Mary J. Blige croon in the background, users can check out a ringtone store, a wierd robot game, a motorola phone collage, or just stare at one of the sections that are "Coming Soon" (including IMV download, the ability to stick your mug in a ringtone video, etc etc). Howard Stern Returns to Terrestrial Radio! That's right, Howard Stern is invading FM radio once again, though surprisingly, he's sticking mostly with Christian radio stations and non-commercial radio. Well, ok, it's not just Stern. And it's not even on purpose. But apparently it's a recognized phenomenon where satellite radio is bleeding into lower frequency FM radio stations (between 88.1 and 89.9 FM). This happens when a motorist's after market satellite radio receiver transmits satellite radio signals to a car stereo at a certain frequency. If a car in the next lane happens to be listening to that same frequency...well, a Jars of Clay jam may be interrupted by Stern's voice yelling, "Show me your bre#sts!!" NPR is currently in discussion with XM and Sirius to solve the problem...there are more complaints on this matter than you'd expect. More on the phenomenon at Billboard Radio Monitor. The same problem can also be caused by Mp3 players using transmitters to send music to car stereos. In effect, anyone one carrying an FM-enabled iPod is running a mobile, pirate radio station. I love the idea of making cars around me listen to what _I_ want them to listen to. Maybe Wesley Willis? Or the Lord of the Rings Trilogy audio book set? Broo-ha-ha-haaaa!!! Alpine Launching Bluetooth Stereo Adapter...iRadio To Follow? You may remember that Alpine is also planning to make Bluetooth accessories specifically for iRadio-enabled phones. ...Extrapolating these facts wildly leads to the following flawed guestimation: perhaps Alpine will be releasing a series of Bluetooth adapters for stereos at the same time, including one for iRadio, which could naturally imply that iRadio is launching on or around June 30??? Ok, ok, let's not get ahead of ourselves. But one can dream. Hopefully, an iRadio-specific version of an adapter will cost less than $200, the listed price for the KCA-100BT. Woohoo! Don't bother trying this with "sirius" or "xm", those keywords blow the above out of the water. Steve Rubel at Micropersuasion had some additional fun with Google Trends...nice. Maybe Motorola needs to target smarter consumers... 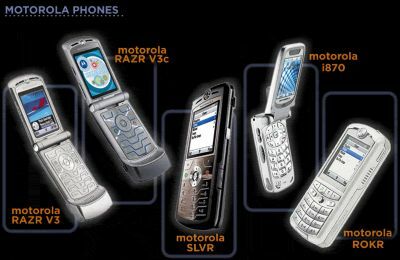 If only I had a camera phone, I could sweep this contest and win a Motorola V3x phone!! Motorola is combining a number of developer initiatives, beginning with MOTOCoder, iDEN, and Horizon, and uniting them into a single, uber-resource called MOTODev to "...help foster innovation in application development and delivery by connecting developers with the resources they need most -- tools, SDKs, and clearly defined go-to-market initiatives." The launch includes a phased approach, with the first phase being the new web portal. Future phases will help developers build and market their applications, by providing richer technical resources and expanded business programs. Everyone's jumping on the iRadio name bandwagon. Orb Networks, which develops software that enables "...consumers to enjoy their home and Internet TV, music, videos, photos, podcasts, and other digital content from mobile phones, PDAs, and laptops everywhere..." is updating its service to include what it refers to as iRadio feeds, or podcast and internet radio feeds. Must have some experience in advertising, direct and retail promotions, web-based promotions, PR, tradeshows, events, and various approaches to guerilla marketing. The Motorola Digital Media Solutions crew was at Leadership Music Digital Summit 2006 ('..a full day dedicated to the business, creative, and legal issues surrounding digital music..') a couple weeks ago. And so were Mp3-playing Pez Dispensers!! Mike Gaumand, VP & General Manager, spoke on the panel titled "New Radio" which discussed internet/satellite/wireless/etc. radio. Dave Ulmer, Sr. Director of Marketing, first hosted a session entitled "Gadgets, What's In The Bag?" along with Ted Cohen (Sr. VP, Digital Development & Distribution, EMI Music). Immediately afterwards, Dave moderated the panel entitled "Music & Entertainment Innovations," which discussed new distribution technologies for music, video, and movies. Busy, busy. 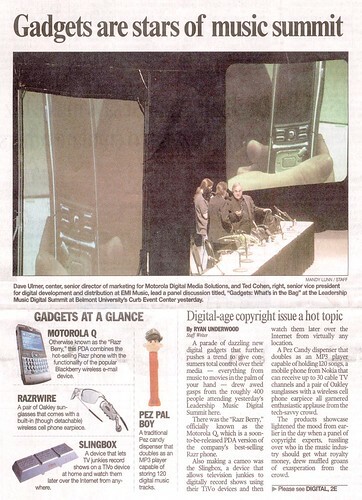 The snapshot below was taken of an article in the Tennessean (click to enlarge...a paid subscription is required to view the full article) showing Ted and Dave showing off some gadgets. Check out the Mp3-playing Pez dispenser...awesome.